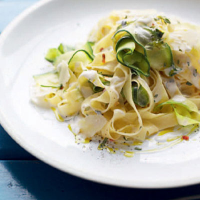 Meanwhile, cut the ends off the courgettes and pare them lengthways into thin ribbons. Drain the cooked pasta, reserving a little water. Toss it all into the sauce. Serve with the rest of the parmigiano reggiano sprinkled over. The grassy, herbaceous feel of the Champteloup Sauvignon Blanc from the Loire will complement the fresh feel of the dish.